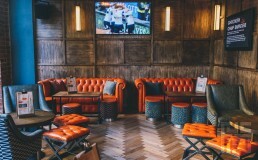 When Arc Inspirations announced the expansion of their most successful sports bar concept, The Box, and the step from Headingley into Leeds city centre Fusion By Design were asked to provide the interior design. We were asked to create a grown-up version, evolving the original well-loved student venue as the new site is based in the Financial District of Leeds. The bar concept is predominantly a sports bar with key elements that broaden its appeal for all day drinking and a late-night venue for students, city workers and residents, ensuring that there was enough appeal to a female audience. The layout needed to be flexible with bookable booths, sharing tables and relaxed casual seating. Hosting several TV screens for all day live sports viewing, a stage for live entertainment and a DJ booth in the main bar area. We also included two private dining rooms in the basement for private parties or business meetings. The colour palette is a mature muted colour scheme of burnt orange and olive green inspired from the buildings past as a bank, with exposed brickwork and concrete ceilings. Adding warmth and sophistication with solid wood natural oak timber floors and wall panelling with a monochrome tiling details give a nod to the sports theme relating to the checker flag. 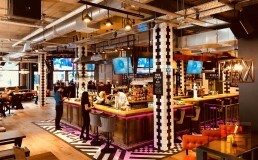 The impressive island bar is the main focal point designed with the beer tanks being integral. The bar counter hints at the site’s former use as a bank with metal finish and rivet detailing inspired from the Vault. The industrial style furniture is designed with sharing in mind and for guests to get up and dance on the benches when the live music gets going. Two shuffle boards feature on a raised area surrounded by sharing tables for groups to book. As you enter the bar there is an impressive ceiling suspended TV rig with feature lights and glitter balls to provide an area for a dance floor in front of the stage. The private dining rooms, the Vault room and Strong room, have flexible seating and can accommodate board room functions and casual seating parties each with their own screens. The vault room has its own private bar and both rooms have exclusive use of the ‘booze bells’ for signalling service. The strong room has its own darts lane for hire with electronic score board. 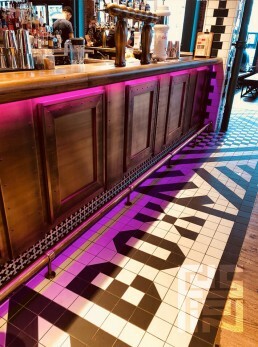 The colour scheme in the basement is dark and atmospheric providing a more intimate scene highlighted with artworks relating to the history of the building and local Leeds with bold graphic stylised prints. The furniture is more opulent with rich velvet fabrics, leather sofas and fixed seating for a more formal arrangement.